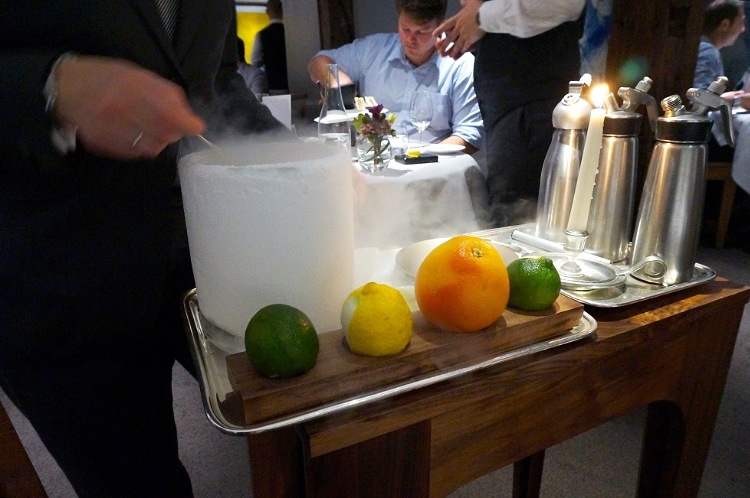 Set in an English village by the name of Bray, in Berkshire, The Fat Duck is owned by the one and only Heston Blumenthal. It spent nine years on the Top 50 Best Restaurants in the World list (even reaching number one in 2005) and is the proud recipient of three Michelin stars. But if you're a foodie, you probably already know all this. I was lucky enough to indulge in the four and a half hour long culinary experience on Jarv's 30th birthday, thanks to his wonderfully generous parents. Jarv had booked two months in advance, as is required (and even then, you'd better be ready to get on that phone the instant the clock strikes 10am), leaving us ample time to get excited. Jarv preferred an element of surprise, not researching too much about what to expect beforehand. I, on the other hand, love to ruin everything for myself in advance and so spent an inordinate amount of time Google-ing dishes and photos. If you are like Jarv, perhaps you should stop reading at this point! 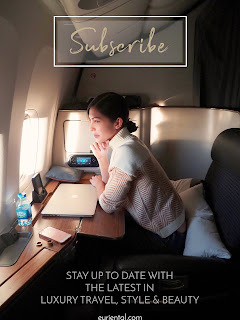 If you're like me, however, then by all means, do stay. Beautifully presented and deliciously refreshing. It dissolves quickly in your mouth (they tell you not to wait to eat it, so I had my camera at the ready, snapping frantically before shoving the entire thing in my mouth). 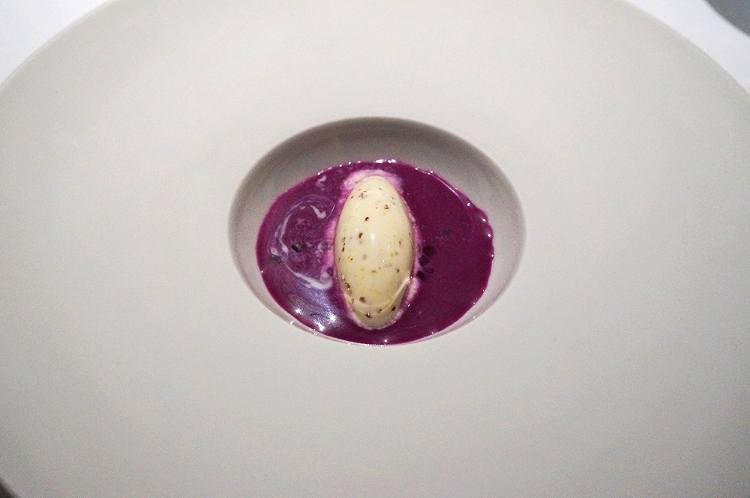 Course number two: red cabbage gazpacho with a pommery grain mustard ice cream. The ice cream melts easily as you swill your spoon around, and the flavours merge into a tangy, salty, cold soup. This was great. The jelly of quail with crayfish cream, chicken liver parfait, oak moss and truffle toast was really a treat to watch - I love a dramatic effect - but in all honesty it isn't quite to my liking. Jarv's dad agreed, whereas Jarv happily gobbled the rest of my dish down, later proclaiming it was one of his favourite dishes of the evening. His mother also loved it. It just goes to prove that you can't please everyone! That often says nothing about the food itself, but rather the individual's tastes. 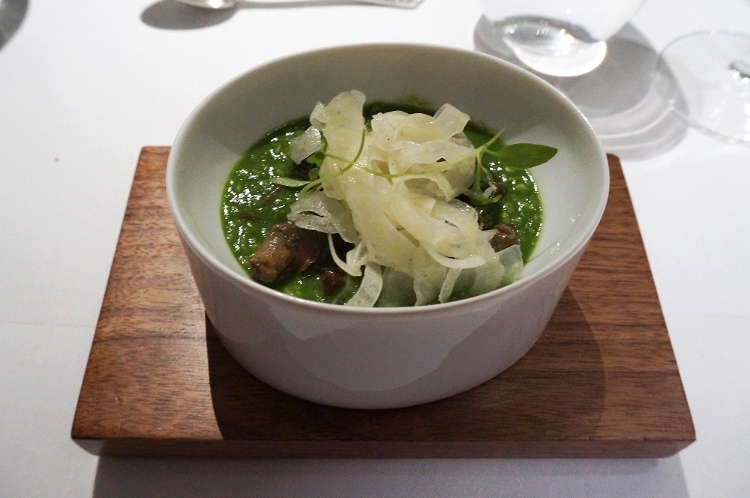 My favourite - call me boring - is this next course, the snail porridge (with a generous amount of parsley, if you're wondering why it's green), a signature dish. Yum. Served with Iberico ham and shaved fennel, I can't get enough. It is all I can do to refrain from licking the bowl clean. I would happily eat this dish over and over. 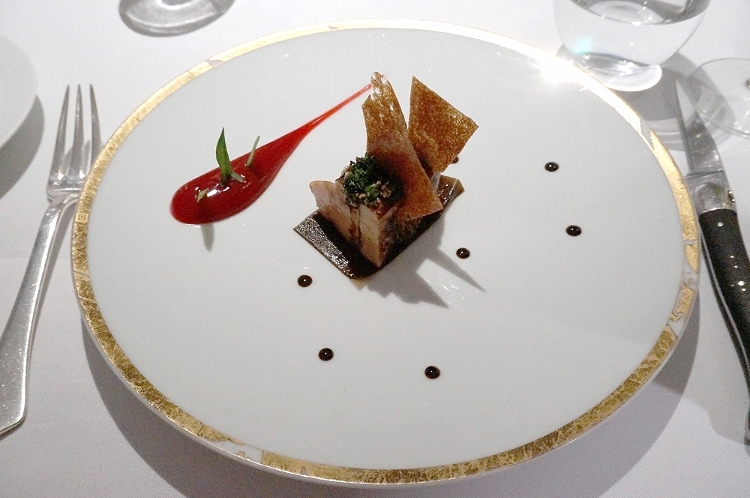 Next on the menu is a crowd pleaser; roasted foie gras, barberry, confit kombu and crab biscuit. 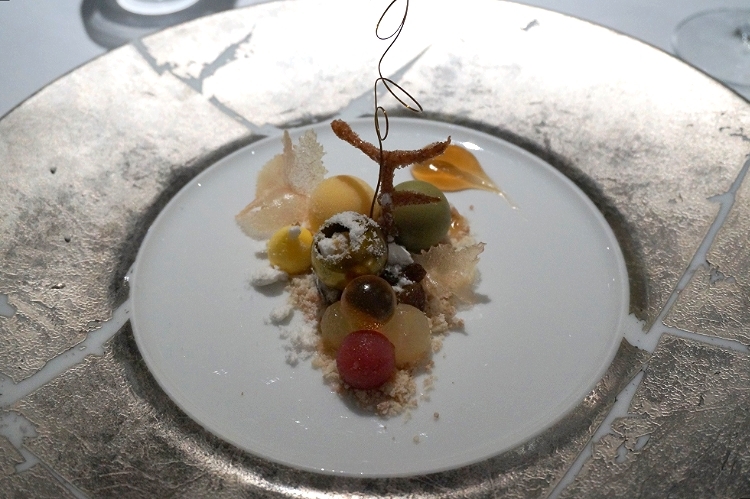 Although I have no idea what a barberry is, you can't really go wrong with a dish like this. It was sweet, it was salty, soft and melty but also crunchy. 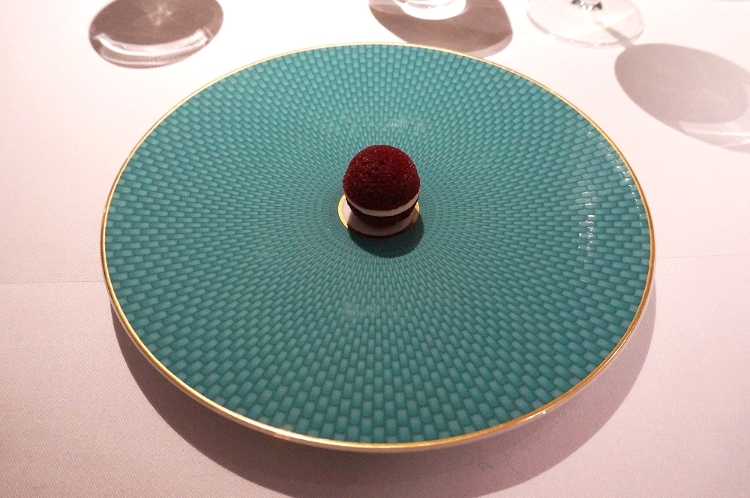 A perfect combination of textures, flavours and rich fatty foie paired with the slight sharpness of the berry. The Mad Hatter's Tea Party is a fun one. 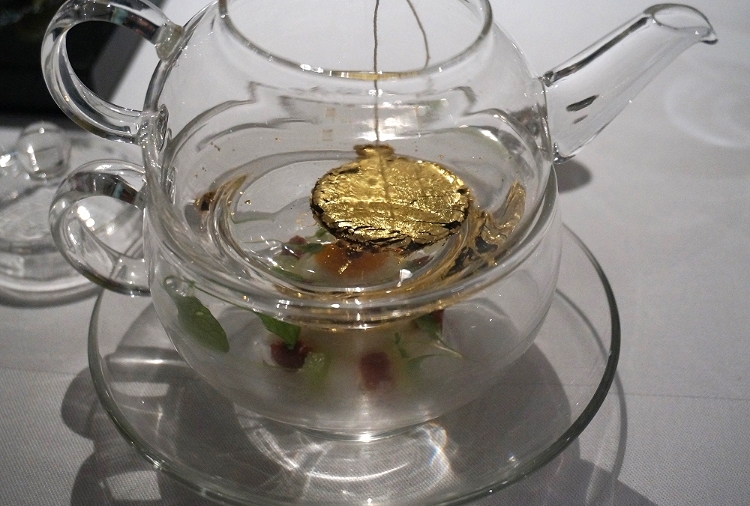 Mock turtle soup is served with a "pocket watch" (frozen beef stock) you must dip into the hot water. In the middle of the table sits a cake stand full of...toast sandwiches. Literally, two slices of untoasted bread with a filling of toasted bread. "Haha," Jarv says. "Uni memories." I have no idea what he is talking about, but apparently I should be ashamed to call myself British without knowing about this food trend. Hey, I didn't grow up here! After your tea has "brewed" (aka after the pocket watch has completely dissolved), you pour it into the cup below. It's a tasty broth, fragrant and comforting, although not unusual. You sort of drink it up in a few sips and are left thinking, Okay, great. Next? "Sound of the Sea" is another of Jarv's favourites, and a Blumenthal classic. Each person gets a pair of headphones tucked into a beautiful seashell (and attached to a mini iPod, of course). 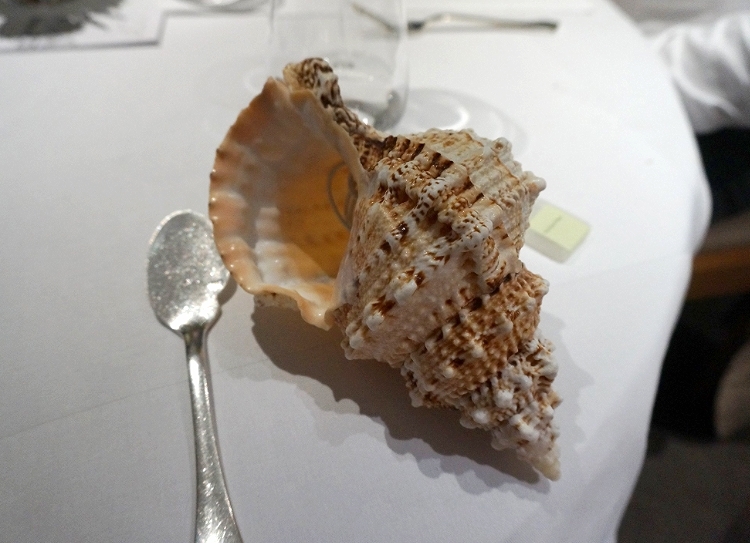 You then eat this course to the sounds of gently crashing waves and seagulls; soothing sounds of the seaside. 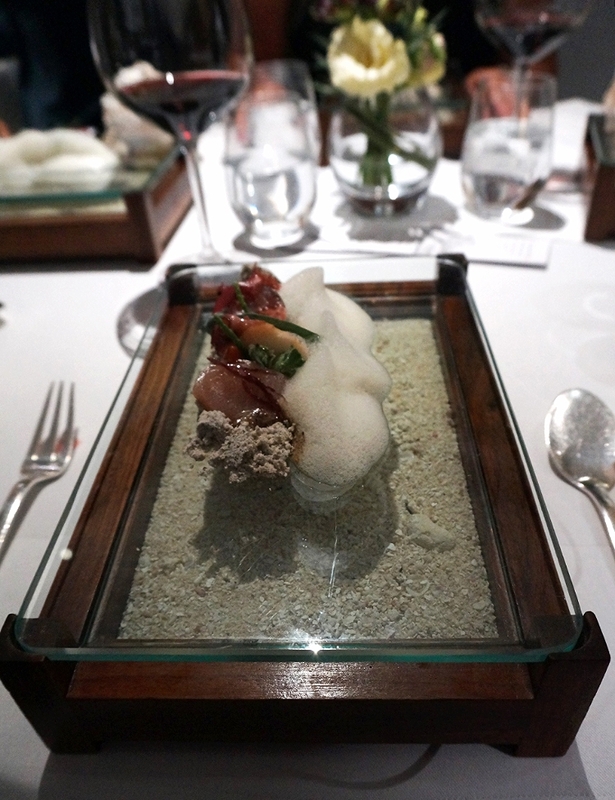 A stunning presentation unlike any food experience I've ever had, with edible sand made of fried sardines, eel and tapioca, a foam created from the leftover juices of the fish, seaweed, razor clams, abalone, oyster and shrimp. 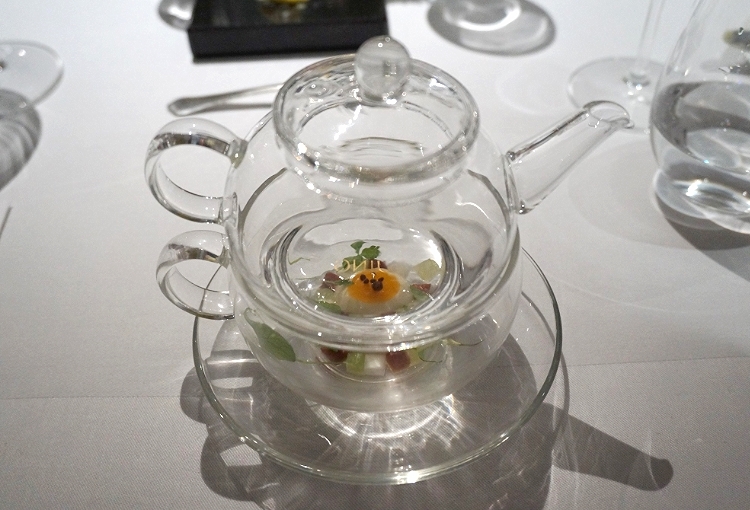 Although this course is an absolute delight to my eyes and ears, I'm afraid, again, the flavours just aren't to my liking. Mostly, it's the sand and foam; too salty, just slightly unpalatable to me. I just don't like overly salty seafood flavours (anchovies - only on a pizza. Sardines, meh.) The seafood itself, however, I eat happily. 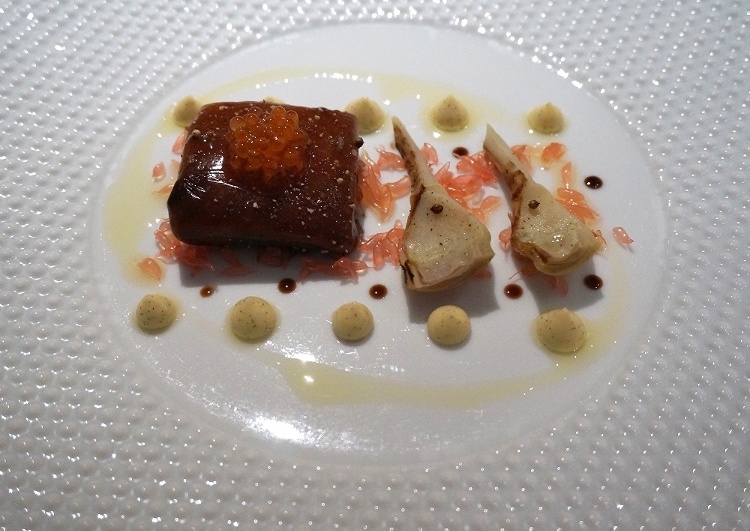 Course number eight: salmon poached in a liquorice gel with artichokes, vanilla mayonnaise and golden trout roe. Um, I think. This sounds interesting. Well, it is delicious. Oh, that salmon just falls apart, the roe pops pleasantly as you chew, and I'm a sucker for artichokes. The licorice flavour is very light and not at all overpowering. Plus, any dish with grapefruit is a winner in my eyes. 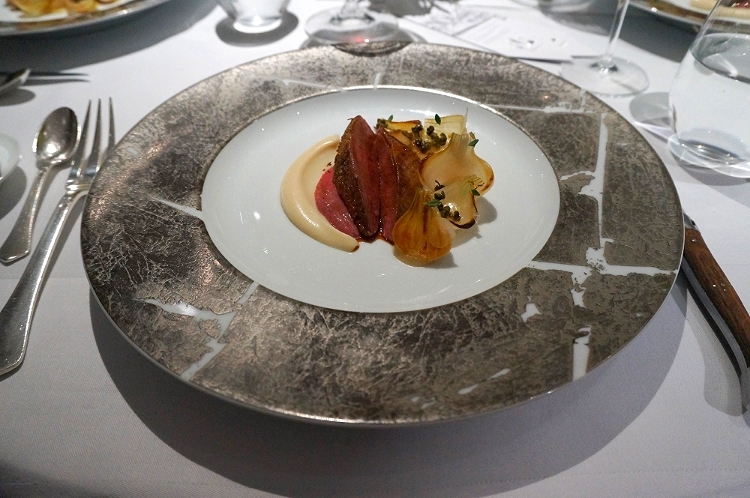 Anjou pigeon with smoked onion and malt. Another gorgeous dish. I love pigeon, having grown up eating a lot of it in China, and here it is cooked to perfection. Hot and iced sweet tea is served (no, literally - it's both hot and cold at the same time) to cleanse your palate, and then it's onto the desserts with an eager clapping of the hands from me! 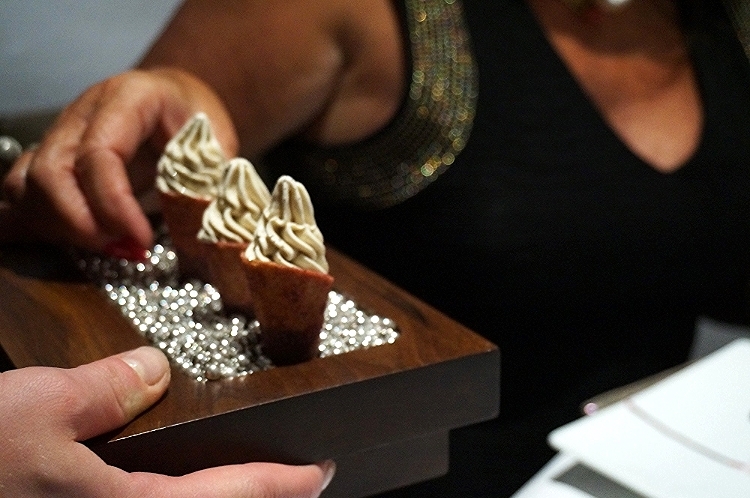 We're offered gorgeous mini Hojicha tea ice cream cornets to eat alongside the first dessert dish, cloved caramelised blackberries. Then, Botrytis Cinerea. Presented in the form of a bunch of grapes, each individual ball has the distinct flavour of a different type of wine from a particular region, in various textures, too. From crumbly to jelly-like to chewy, it is a selection of sweet, sour, sharp. Presented elegantly, yet full of playfulness. 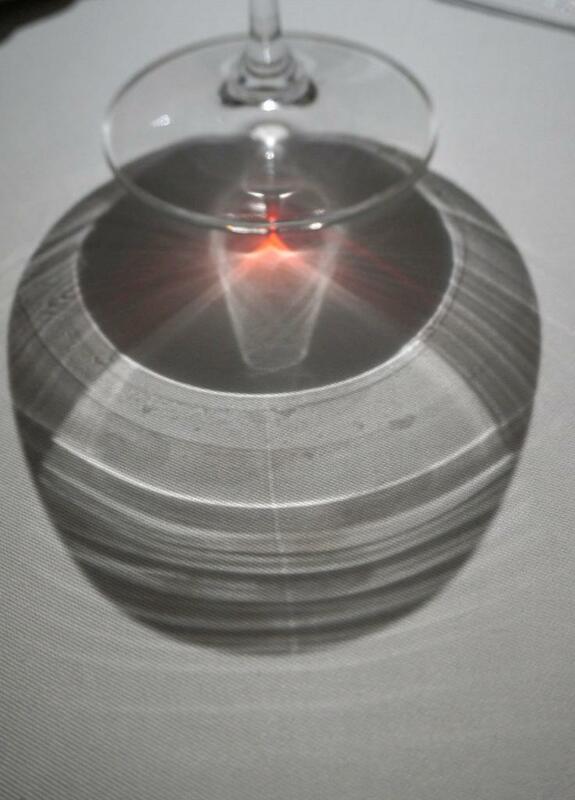 I hypnotised myself with the patterns the wine glasses were creating on the tablecloth for a while. Mostly I think I was just feeling too stuffed and sleepy at this point to engage in any meaningful form of conversation. Two more courses to go and we are done: Whiskey wine gums (little bottle shaped gummy sweets, each infused with a different type of whiskey. Great fun, and delicious, too) and "Like a Kid in a Sweet Shop". A pink and white striped paper bag is handed to each diner to either eat at the table or take home for another time. We eat ours at the table, in true pig out style. 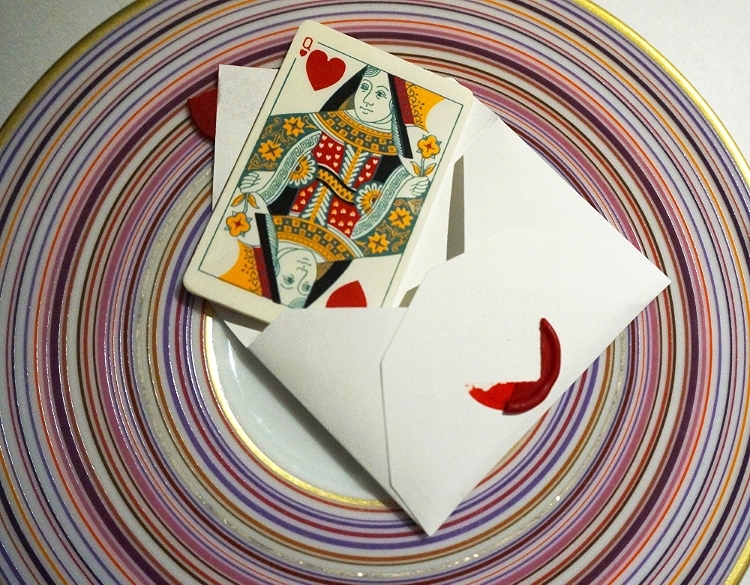 Pictured below is the lovely Queen of Hearts - a white chocolate, biscuit and jam treat. Yes, the envelope seal is edible, too. 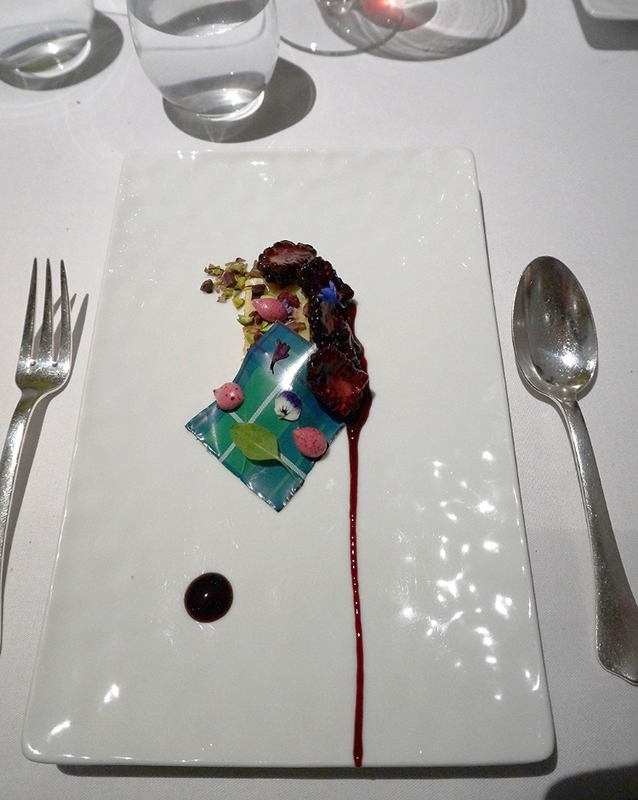 Every aspect of dinner at The Fat Duck is a surprise, a delight, a performance. 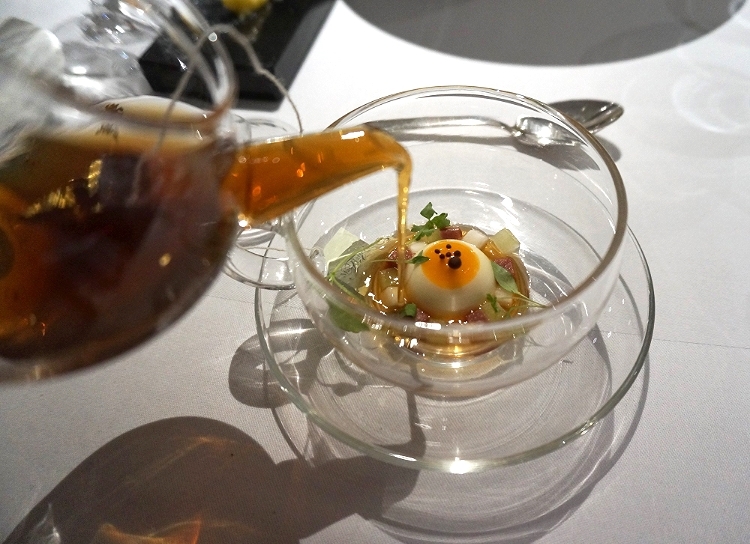 The meal is inventive, whimsical, visually stimulating and at times nostalgic. It's not an evening you will forget any time soon. Or ever, for that matter. Heston, you truly are a gift to food lovers!